609-1.1 This item shall consist of an aggregate filled polymerized seal coat composed of a single or two coat application placed on the previously prepared existing asphalt wearing surface, in accordance with these specifications, and shall conform to the dimensions and typical cross section shown on the plans. 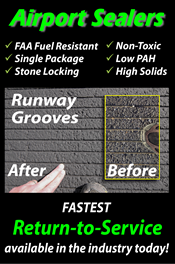 Application of this material will be on the runway pavement, aprons, taxiways, fueling areas, or anywhere the paved airfield surface requires fuel resistance to adequately protect and extend pavement life. Maintaining adequate friction values on the runway surface is of vital importance. Therefore, prior to any application of this material to the runway surface, friction testing of sample applications will need to be done as described herein. All friction testing and certification will be supplied by Contractor. The Contractor is advised that this Item will be deleted from the Contract if adequate friction values cannot be achieved within designated runway closure construction window identified elsewhere herein. The Engineer’s decision as to the acceptability of the friction values of the test applications and whether or not to proceed beyond the test phase will be final. 609-1.2 QUANTITIES OF MATERIALS PER SQUARE YARD. The seal coat shall be applied at a minimum spread rate of 0.27 gallons per square yard. This rate will be calculated based on concentrate. Any dilution water shall not be included in spread rate calculation. The Contractor shall submit gradation and manufacturer’s specification for review at or prior to the pre-bid for approval. Parameter Test Method Min. Max. * The sieve result is tested for reporting purposes only. Sieve test may be waived if no application problems are present in the field. The bituminous base residue shall contain petroleum derived asphalt and will not contain other diluents or hazardous materials such as creosote, halogenated solvents, mercury, lead, or other carcinogens as defined by the 29 CFR 1910.1200. The material to be used will be compatible with asphalt concrete. Performance records of material used at other airports shall be supplied by contractor. Curing times, under manufacturers recommended application conditions, shall not exceed 6 hours. The contractor shall also furnish and submit to Engineer, manufacturer’s certification that the material is the type, grade, and quality specified for the loads of product delivered. The certification shall show the shipment number, refinery, consignee, destination, contract number, and date of shipment. The material must not exceed the Volatile Organic Compound (VOC) content limit established for the airport location. 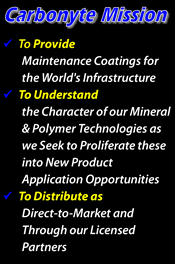 The aggregate filled polymerized seal coat shall be Carbonseal-FR manufactured by Carbonyte Systems, Inc., 3 Wayne Court, Sacramento, CA 95829, (916) 387-0316 or an approved equivalent per the Project Engineer or Owner. 609-3.1 WEATHER LIMITATIONS. Bituminous material shall be applied only when the existing surface is dry with the atmospheric and surface temperatures remaining above 55°F through curing phase. No material shall be applied when rain is imminent (inside 24 hrs.) or when dust or sand is blowing. 609-3.3 EQUIPMENT AND TOOLS. The seal coat may be applied with manufacturer-approved spray or squeegee buggy, or by properly outfitted distributor truck capable of handling aggregate materials. The equipment shall be in good working order and contain no contaminants or diluents in the tank. Spreader bar tips must be clean, free of burrs, and of a consistent size to maintain an even distribution of the seal material. Any type of tip or pressure source is suitable that will maintain the specified application rate during the application process regardless of the speed of the truck. Test the equipment under pressure for leaks and to ensure it is in good working order before use. The spray buggy or distributor truck shall be equipped with a 10-foot minimum spreader bar and capable of installation rates of a minimum 100 gal./minute. It shall be capable of specific application rates in the range of 0.05 to 0.30 gallons per square yard. The spray buggy or distributor shall be equipped to hand spray the seal coat areas identified by the Engineer. 609-3.4 PREPARING UNDERLYING COURSE. The asphalt surface to be treated shall be free of all dirt, sand, weeds, grass, rubber, and excessive oil and grease. The surface shall be cleaned with a power broom or power blower supplemented by a hand sweeping or any other means required to remove deleterious matter to the satisfaction of the Engineer. Any crack sealing shall be completed and surface cleaned prior to applying pavement sealer. This cleaning work is considered incidental to the seal coating. or marker with equal equipment and remove and repaint any paint marking at no cost to the Owner if cleaning is not satisfactory to the Owner. 609-3.5 APPLICATION OF BITUMINOUS MATERIAL. The aggregate filled polymerized seal coat material shall be applied upon the properly prepared surface at the rate and temperature specified using a pressure distributor to obtain uniform distribution at all points. To insure proper drainage, the strips shall begin along the centerline of the pavement on a crowned section or on the high side of the pavement with a one-way slope. During all applications, the surfaces of adjacent structures shall be protected in such manner as to prevent their being spattered or marred. Bituminous materials shall not be discharged into borrow pits or gutters or upon the airport area. rate at a location designated by the Engineer. The requirement may be waived at Engineer’s discretion or Engineer may accept coefficient of friction certifications of prior airfield projects. If required, all friction testing shall be performed by the Contractor. Friction testing processes and equipment shall be as required by Federal Aviation Advisory Circular 150/5320-12, “Measurement, Construction, and Maintenance of Skid Resistant Airport Pavement Surfaces”. All required friction testing shall be performed by the Contractor. Friction testing processes and equipment shall be as required by Federal Aviation Advisory Circular 150/5320-12, “Measurement, Construction, and Maintenance of Skid Resistant Airport Pavement Surfaces’. All friction testing results will be provided to the Engineer for review. The Contractor shall have a qualified manufacturer’s representative present in the field to assist the Contractor in carrying out the test section application and to be available during friction testing of the applied material. The aggregate filled polymerized seal coat material shall not be applied over any existing paint markings or areas shown on the plans to receive paint markings. 609-3.6 APPLICATION OF AGGREGATE MATERIAL. Sand or aggregate blotter is not required or recommended for aggregate filled system. 609-3.7 CORRECTION OF DEFECTS. Any defects, such as raveling, low centers, lack of uniformity, or other imperfections caused by faulty workmanship, shall be corrected immediately to the satisfaction of the Engineer. All defective materials resulting from over-heating, improper dilution, spray tip malfunction (holidays), under or over sanding, shall be remediated prior to opening to airport traffic.